Clive Griffiths Director of Rugby at the Doncaster Knights. Even director of rugby Clive Griffiths, who has not pulled his punches, had a smile on his face after seeing his charges hold off a late Bedford rally and claim their first win in four games. 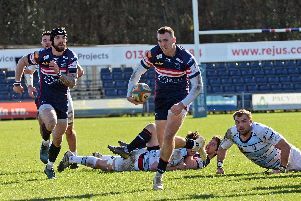 “It was an outstanding win for us given the results last night and Richmond’s win over Ealing today because we would have risked been drawn right back into the relegation battle again if we had lost,” he said. “It was a gutsy win and a great defensive performance against a team which has shown all season that it can be potent in attack. To restrict them to three tries, one from an interception, was outstanding. “I thought we could have had a bonus point – and we had our chances - but we went off script in the second half and became too nervy. “But for sheer guts and determination and desperation – and those were the words we used going into the game – I thought it was outstanding. “We’ve all been down of late and I’ve been very critical but when you take everything into account that has to be one of the best wins during my time here. “Results over the weekend have increased our chances of finishing in the top half of the table but, as |I say, my main concern is picking up enough points to make sure we are completely safe and another win should do it.